With a cover design patterned after the ever-popular 1896 Marine Band, the Big River is optimized for a strong, bright tone. 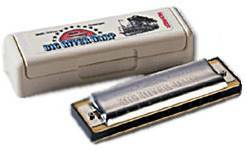 This is a great harmonica value that is available in the full range of key choices. This book is a complete guide to playing the 10-hole diatonic harmonica. Its purpose is to help the beginning student avoid the trail and error method of playing the harmonica through step-by-step technical instruction and an extensive, graded repertoire.